The benefits of involving people with disabilities in your web projects will far outweigh the extra work, as you'll be gaining a much deeper understanding of how users with disabilities are motivated, how efficient your site may be, and how effectively all of your users can be while using your site. 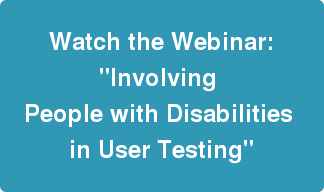 I hosted the webinar "Including People With Disabilities in Your User Testing" and below is an introduction to the topics covered in the webinar. First, let's cover the common question of whether an issue is about accessibility or usability. In most cases we can say that it's both. So much of what you do to improve usability has a positive effect on accessibility. For example, a clean, well-designed navigation system makes it easier for all of your users to find the information they are looking for. Usability is concerned with effectiveness, efficiency, and satisfaction—and accessibility is considered a subset of usability—so a website can’t be considered usable unless it’s accessible. Many people still see accessibility issues as affecting only a small group of people. In fact, accessibility covers a very broad range of disabilities. On one end of the spectrum, there are those with serious mental or physical disabilities—usually pretty easy to define. What about the other end? What about people who wear glasses? People who are color-blind? Those who have dyslexia? What about those people who prefer using a keyboard instead of a mouse? Do they fall within the range of disabilities (yes!) and how do you address the issues they may have? You’ve made the wise decision to include people with disabilities in your project. What next? “Where can I find a person with a disability?” you may be asking yourself. There are numerous ways to engage people with disabilities, and the ease of finding a willing collaborator may vary according to your industry and type of organization. Don’t fear; there are many great resources available. For example, if you are working in a higher education environment, check with your campus disability services office. There are students and even faculty or staff members who are willing to participate and can give you excellent feedback. When do I involve people with disabilities? Another question that comes up as you engage with your new consultants is when to actually get them involved? From a planning point, be sure to get them involved as quickly as possible. They may not actually sit down and test your site until later in the process, but if you are not planning for their involvement from the beginning of the project, you will run into barriers that you should have already addressed. During the webinar, we will give you a roadmap to help plan out how and when to involve people with disabilities. A little planning and knowledge of working with people with disabilities will make your web project flow quite smoothly. Considerations may include how you plan your testing location, what conclusions you hope to gain, and a few matters of etiquette. It’s possible that you already have a suitable test environment already set up. Just be sure your accommodations for people with disabilities are really no different than you normally plan: a comfortable environment, which allows your tester to concentrate on the tasks you give them. That said, never make assumptions, speak normally, and always be aware of personal space. Given the proper setting, you will be amazed at the conclusions your testers provide. Be sure to carefully consider all feedback and avoid assuming that feedback from one person with a disability applies to all people with disabilities. A person with a disability does not necessarily know how other people with the same disability interact with the web, nor know enough about other disabilities to provide valid guidance on other accessibility issues. In this web accessibility webinar, we build on these ideas of including people with disabilities in your web project. We will cover the topic in more detail and help you figure out some ways to gain even more important insights.